The typical Labor Day traffic jam on Lake Riva finally died down around 7 pm. I headed straight to the river side of point and had the river basically to myself. Gentle breeze, stillwater and a touch of fall in the air. 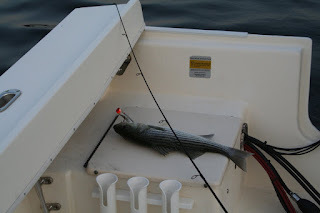 First drift produced nada, so I moved to broad creek side and finally had a nice slam from 18 inch Striper. About 5 minutes later I had a huge blowup that missed. I hit the same spot with next cast and wham...missed again. Never did get her, but looked like a 26 in plus fish. Oh well, back to river side where I picked up another keeper up against the grass beds. Sorry to see the summer end, but it will be nice to have my river back.